Chef Kevin Hynes presenting his amazing creations with Galway Bay Seafoods and the new Dock Deli Bar. Photo: Anita Murphy 2018. 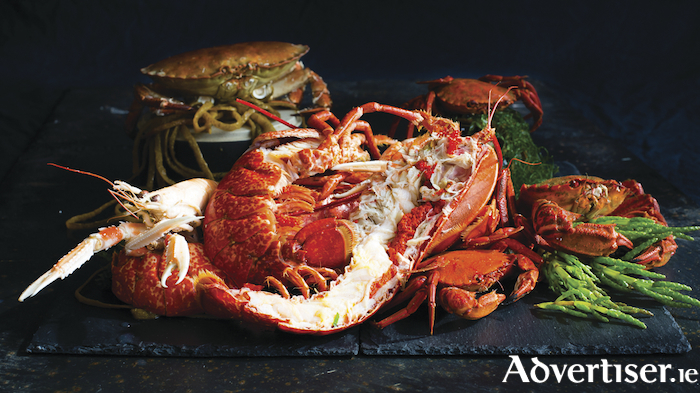 The Dockside Deli is a one stop destination for seafood this Christmas in Galway city. With an unrivalled variety of freshly cooked seafood prepared daily, the deli boasts Galway’s largest raw seafood and ready to cook counter. Products for the Christmas table include freshly steamed and cracked lobster, hot smoked beetroot and dill marinated salmon, decadent stuffed local crab, and Dockside Deli's signature whole poached and dressed Christmas salmon. The Dockside Deli has its own in-house smoker, which chef Kevin Hynes uses to hot smoke local mackerel on the bone, mussels, herrings, and fresh salmon. Other nutritious additions include the line-caught squid salad and crunchy Connemara seaweed slaw, alongside freshly poached Atlantic prawns and home made mackerel pate. For a thoughtful gift with a difference The Dockside Deli has got you covered with a choice of gift vouchers, Christmas hampers, or its ever popular cookery classes hosted by head chef Kevin Hynes. Each cookery class showcases a full seafood demonstration, delicious sit-down two-course meal, take home recipes, and wine for all participants. With all of the produce at The Dockside Deli being locally, sustainably, and ethically caught, it is clear to see why it has become Galway’s number one seafood destination. To place your Christmas order, email [email protected], call (091 ) 563 011, or stop by the retail store at New Docks, Galway.